The Metro 5M stem caster can support 200 pounds. Since it swivels, maneuvering equipment around your establishment is simple. The wheel is made of resilient rubber that reduces the noise the wheel produces when it's in use and helps absorb the shocks of rolling over small variances in the floor. 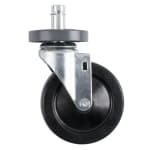 The Metro 5M stem caster is designed to reduce the likelihood it will scuff or scratch your floors. It fits Metro Super Erecta® shelving.